I'm planning a run to the river this Saturday morning 9/2. The Hassayampa river, in native American, means upside down river. That's because from Wickenburg, as you go upstream, the river begins to flow deeper and faster. The riverbed around the town of Wickenburg is so sandy, that the river runs underground unless there's a lot of rain upstream. But a few miles further up, the Hasayampa riverbed turns more rocky, so the river actually flows on the surface, and has carved out a couple of odd canyons, due to flooding, over the eons. The main attraction, of "Wickenburg Box Canyon" is easy to get to via main roads. The slot canyon further up stream, and outer loop back to Blue Tank road? I'm not sure if the trail is open... But the way I'm taking Saturday morning, is Constellation rd. to Blue Tank rd. Then take the less traveled "jeep trail" that ends up being the back way to the Hassayampa wash next to box canyon, then if the water's not too deep, we can go further upstream to slot canyon, and maybe all the way back around the outer loop to Blue tank road? I plan to let our son splash around in the water, so wanted to leave early since it's hotter than H*LL by 1100 hours. Most of the off road folks I know in Wickenburg will either be out of town for Labor day, or be hung over on Saturday morning, so not expecting much of a turn out. I'm in Surprise Val. I may be up for it . I almost drowned my FJ in the Canyon a year ago when there was a pond in it. I know the area fairly well. Let's see if you get some response. "It's hard to talk your way out of what you behaved your way into"
My off road friends in the area have told me you can avoid deep water, and still go pretty far up river, maybe all the way around the outer loop, if your creative. Personally, I'd rather turn around, or back out than take a chance with deep water, or overly rough terrain. I'll have a 9 year old wheeler in the passenger seat, so plan to keep it somewhat mellow. I've already had 3 people tell me they'd be in, if it was an evening, or night time run. But I'm still learning the area, and wan to take my son along, so sticking to the early schedule. I've run the Hassayampa a number of time on both side of Wickinberg. At times there ihas been 3-4 feet of water at a narrow point blocking the river bed gorge. Usually not. A little water makes to fun. When you get to the end of the gorge you can't drive up the rocky overgrown creek. You go up on the left and around. If your son has never been to the Box Canyon that is half way thru the gorge I expect he'll like it. It's pretty unique. As I expect you know. I like going into the river from the Santa Domingo Wash south of town at the area ATVs run. 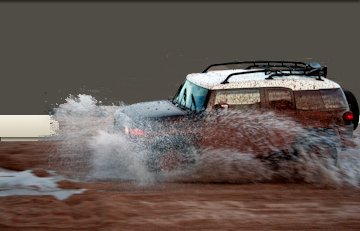 Actually Viloraptor me were racing our FJ's in that sand a couple of months ago. Fun.. There are signs to keep you from driving up into the town. I just returned from a 5900 mile road trip with the flu so I'm still not a hundred percent sure how I'll feel Sat, but if you really want to explore and play in the river bed two trucks with wenchs and sand ramps are a good idea. I have both. Early in the morning is good for me too. I wonder if those sand ramps will help you get out of quicksand? Can this be ran with a mildly upgraded 4x4? I sold the FJ and have a Taco with 3" OME and Michelin AT2 tires. In my experience what they call quicksand in the Hassayampa are soft or wet spots maybe two feet deep where you can get stuck, but it's not like it'll swallow your truck. It all depends, if the riverbed is dry there is no problem, but if it is it's really wet it's impassable. The toco should be fine if you air down and follow the tracks. No serious rocks in the river bed. Don't know about the rest of the run Vaportrail has planned. I'm still felling kind of rough. I'll let you know tonight if my wife releases me for duty. How many trucks? When will we be back? This is really just a small scouting run. So far, it's me and one other non-member on the for sure list. I work at a bar in Wickenburg, and have a few more people in mind to invite, if they show up this evening. I'm sure we'll be back in town by lunch time. I believe I am in. I take it there is only one Mcdonalds in Wickenburg near the constellation rd? If so I will see you there at around 8:30 am. How did they know my truck was dusty?? Sounds like fun, I'm 50/50. My daughter isn't feeling that great this evening. CB channel?